This article was originally posted at The National Interest. Five hundred years after Martin Luther unleashed his jeremiad against the Catholic Church, a question has seized the attention of the West with a special urgency: can Islam undergo its own reformation? The terrorist attack on Iran’s national parliament and shrine to Ayatollah Ruhollah Khomeini; the assault on security officials in Paris; the knife-wielding attack in London; the rampage against teenage concert-goers in Manchester; the assassination of Christian pilgrims outside Cairo, Egypt; the raft of executions of civilians in Iraq; the sectarian rage fueling the Syrian Civil War—it all suggests a sickness in the soul of Islam. What is needed, many argue, is a new interpretation of sacred texts that delegitimizes the advocates of terror. Even Egyptian president Abdel Fattah el-Sisi—no champion of political liberalism—has called for “a religious revolution” to rescue Islam from those who would pervert its message. The problem with this approach is that it evades the bitter historical lessons of Luther’s disruption of medieval Christianity. For all that it accomplished, Luther’s revolution failed to transform a society that had grown accustomed to burning heretics, persecuting the heterodox and treating religious dissenters as enemies of the state. Make no mistake: Luther’s assault on the Catholic Church was, at its heart, a theological one—a debate about the authority of the Bible and the true path to spiritual salvation and peace with God. Against the dictates of popes and princes, Luther introduced a new source of authority into medieval Europe: individual conscience, guided by a fresh interpretation of scripture. “My conscience is captive to the word of God,” he declared. “I cannot and will not recant anything, for to go against conscience is neither right nor safe.” This was the most radical aspect of his revolution. Nevertheless, Luther was unable to overturn the political dogmas of European society. Perhaps the most deeply rooted belief, which is also embedded in the culture of Islam, was that religious conformity, enforced by the state, was essential to preserving order. Most Protestants and Catholics agreed: heresy was a threat to social peace; the safest remedy was execution. 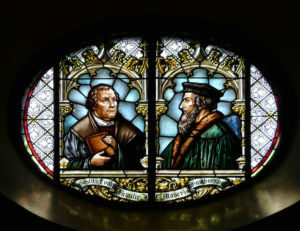 Nevertheless, Calvin’s infamous role in the trial and death of Michael Servetus, condemned and burned as a heretic in 1553, shocked the conscience of some in the Protestant community. They accused the Genevan authorities of adopting the “popish” ways of the Catholic Church. Sebastian Castellio, a French theologian and humanist, broke with Calvin over the issue and initiated one of the first debates over religious toleration in Europe. “I do not see how we can retain the name of Christian,” Castellio argued, “if we do not imitate His clemency and mercy.” Calvin did not yield an inch. The die was cast. Like their Catholic antagonists, most Protestants viewed the political and religious realms as part of an unbroken spiritual unity. For all their theological innovation, they never imagined that the church could achieve its religious mission without the coercive arm of the state. The result, of course, was a series of religious wars in the sixteenth and seventeenth centuries that devastated the social fabric of Europe. Only after this cataclysm were European leaders prepared for a second reformation: a separation of church and state that would enshrine religious freedom as a natural and inalienable right. Like Luther’s campaign, this one also originated from within the Christian community. Roger Williams, William Penn, Pierre Bayle, John Locke—virtually all of the early defenders of freedom of conscience considered the teachings of Jesus their moral lodestar. All appealed to scripture to imagine a new kind of commonwealth: a pluralistic society that guaranteed equal justice under the law, regardless of religious belief. Modern Islam is already undergoing something akin to Europe’s wars of religion. Its reformations—religious and political—are long overdue. I have a question. With the value of hindsight, how do we view the pre Reformation Church, as a political entity or a religious entity? (I acknowledge we still have Vatican City!). Now days, with a clear understanding of the need of separation of Church and State how should we view Islam, which I believe wishes to be known to be adhering to its original foundations, with NO reformation. Should we not treat it as a political entity rather than being politically correct and calling Islam a religion? Or do we need to take a back seat and let a reformation process of Islam take place, aka modern Christianity? As noted, Christian scripture calls for rendering to the state(Caesar) its due apart from what to render to God. It also I ncludes Pauline admonishments to obey the civil authority. I find Islamic texts, the Quran and the Hadith, do not. This raises the question of whether devout Muslims can ever see the separation of mosque and state as anything better than a tear in the social fabric to be mended as quickly as possible.